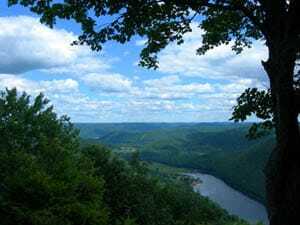 The Donut Hole Trail (DHT) is a long-distance backpacking trail paralleling the West Branch of the Susquehanna River through Sproul State Forest. It is one of the most remote and challenging of the state’s backpacking trails and is for seasoned hikers only, with numerous steep climbs and unbridged stream crossings. Bridges were recently constructed or replaced over Cooks Run, Drury Run, Seven Mile Run, and Paddy Run. Extensive relocations have been made in the Bull Run, Seven Mile, and Merrimam Hollow areas, eliminating many stream crossings. The biggest remaining challenge of the orange-blazed DHT is a deep-water ford of the very wide Kettle Creek that should not be attempted during high water. A yellow-blazed side trail provides a lengthy detour around this crossing. After extensions were added to both ends of the trail by Keystone Trail Association crews in the mid-1990s, the DHT now extends 89.7 miles from Jericho (near the intersection of PA 120 and PA 872 in Cameron County) to Farrandsville (outside of Lock Haven). The west terminus in Jericho is at the end of the village’s only street, off PA 120. To reach the east terminus at Farrandsville, leave Lock Haven on the PA 664 bridge over the Susquehanna, and turn left at the end of the bridge. Drive 5 miles along the river to Farrandsville. Continue for .6 mile after the road turns abruptly inland and passes a church; the trailhead is at the end of the road at a Game Commission parking lot. Access to the middle sections of the DHT is also available at Kettle Creek and Hyner Run State Parks. At Jericho, the backpacker can walk about a mile west into Sinnemahoning to reach Bucktail Path, or walk over the river bridge and to a side street in the village of Wyside to access the Quehanna Trail, via the Old Sinnemahoning Road Trail. Early in the new millennium, this extensive interconnected trail network was expanded with the construction of the T-Squared Trail, which leads from the eastern section of the Donut Hole Trail to the Black Forest Trail. The GARBY Trail also links the DHT at Hyner Run State Park with the Chuck Keiper Trail high on the plateau on the other side of the Susquehanna. Camping permits are required if you plan to stay more than one night at a specific spot. Rock River & Trail, a local outfitter, offers shuttle service; call (570) 748-1818.